Very Cool Vintage Navy Radio from WWII. Cay 23304-A, Telephone & Remote Control Unit. For use with model TBM radio Transmitter system. Manufactured for the Navy Department - Bureau of Ships. Made in Baltimore, MD by Westinghouse. This is a unique piece of history. The knobs and buttons turn and move with the tags and labels present and the jeweled red light lens is unique. 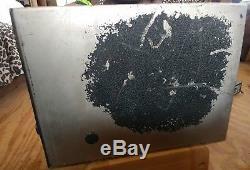 Would make a great conversation item for a Navy Electronics collector or Vet. The cabinet is stainless steel. It looks like it could have been painted black. 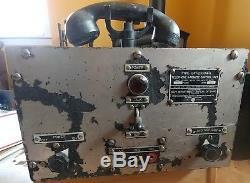 The item "US Navy Military Ship Radio Transmitter Receiver WWII Telephone Vintage Old" is in sale since Monday, April 2, 2018. 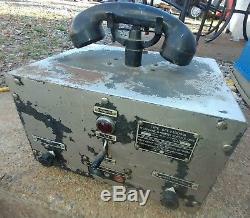 This item is in the category "Collectibles\Militaria\Surplus\Radios"." and is located in Charlottesville, Virginia. This item can't be shipped, the buyer must pick up the item.